So ... not really library or book or tech related. But I saw this on a blog and thought hey! Post idea! Which led me to other teaching blogs. Even though most of them are "regular' teacher blogs and not library blogs I still like following them. Makes me feel like I understand the elementary classroom better (since my regular classroom experience was high school Spanish). 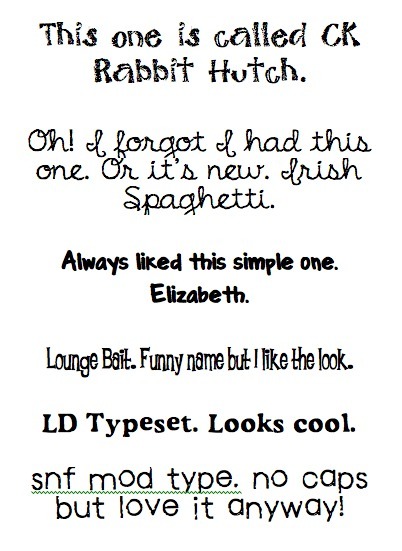 I must admit ... most of the fonts I do not even remember where I got them from. 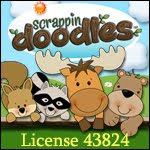 Bad librarian paying attention to copyright and licenses! So you will have to google if you like the look of them. Most are free though I paid for a few. Silly thing is I forget to use the ones I paid for since you have to log in to Lettering Delights for a lot of them. Unless you want to insert (like clip art) each letter separately. 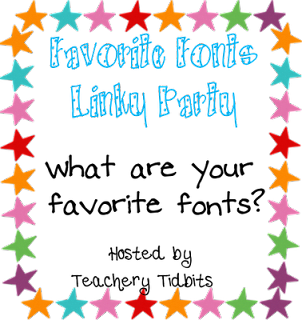 There are lots more but I don't want to be ridiculous or too repetitive with all of the others on the linky party. Rabbit Hutch is best for headlines or titles ... too small and it's harder to read. I don't know that I've ever actually used the Irish Spaghetti one. I just like it. Wouldn't work all that well for school, I guess, cause most of the kiddos couldn't read cursive. Elizabeth. Nice and simple. Works large or small. Same with Lounge Bait. And Typeset. That one makes me wish my brother could open up a bindery (cause he can bind super cool books ... and restore old ones) and I could help him with ... what did he call it. I can't remember. The machine you use to imprint the lettering on the bindings. Wouldn't want to have to set an entire book but could definitely do titles and names and such. Mod Type needs to be short and sweet just cause too much print off kilter and it makes one a little seasick reading it. But perfect for the short and sweet! Have a few more days of meetings and some tech development. And report writing (which I dislike immensely even though I know it is important). Sigh. And then jury duty. First time ever being called. Can you believe it? THEN maybe summer will actually be able to start. Oh I love that Mod Type...super cute! It really does bug me that some fonts don't have capital letters, though...why do they do that??? I'm a new follower thanks to the font linky party!